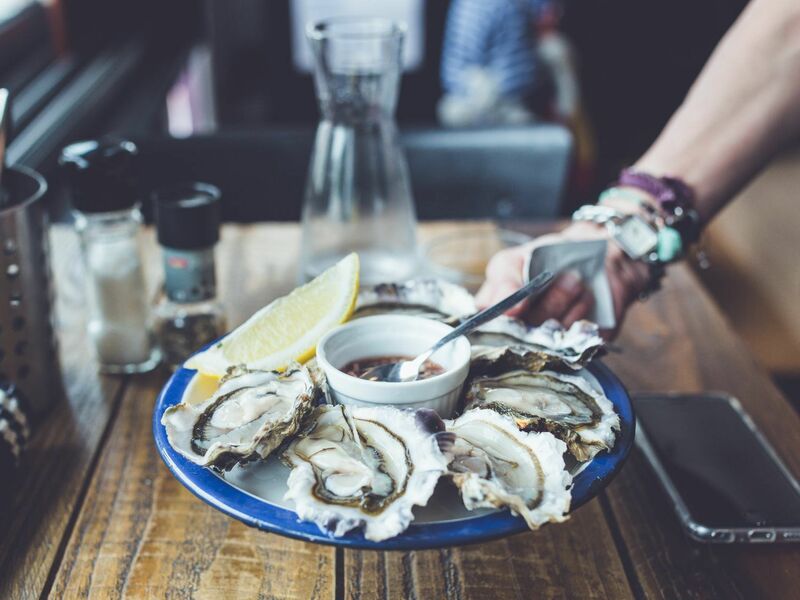 Shellfish Handling Tips - MAC'S OYSTERS LTD. Shelf Life: A live oyster is good to eat. When properly cared for live oysters will live in your refrigerator for 10 to 21 days. Are they alive? When oysters are dead in their shells they are no longer suitable to eat. To see if your oysters are alive, the shell should be closed or close when tapped lightly. Keep in a moist environment: Store your oysters in the refrigerator covered with a moist cloth or keep in the shipping box. Keep oysters cupped or curved side down to preserve their natural juices - they need to keep moist to breathe. Also you should avoid storing near any moving air (i.e. Cooling fans). You should never submerge your oysters for any period of time in freshwater. Oysters need to breathe and should not be stored in an airtight bag or container. 1) Placed the oyster on a cloth, cup side down, with the hinge end pointed towards you. 2) While holding the oyster firmly down with your hand, press the point of the oyster knife firmly into the hinge, twisting the knife. The upper shell should pop open. 3) Cut the upper abductor muscle by sliding the knife between the shell and the meat at the 2 o'clock position. 4) Remove the top shell. 5) Move the knife under the meat to cut the bottom abductor muscle; remove shell fragments, rinse in cold water if necessary. Once opened oysters on the half shell should be put on ice to keep them cold. Download the Oyster Fact Sheet. As long as the clam is alive in its shell it is good to eat. A dead clam will not close its shell when shaken. Clams open and close their shell in response to surrounding temperature and in regulating their respiration. This shellfish should not be kept too cold and the ideal temperature for storing clams is approximately 40 degrees Fahrenheit. Clams should be kept in their mesh bag or in a drainable environment. You should never submerge your clams for any period of time in freshwater. Clams need to breathe and should not be stored in an airtight bag or container. Store your clams in the refrigerator covered with a moist cloth. Live Pacific Oyster: 10 to 14 days or more. Live Manila Clams: 7 days. Live Savoury Clams: 14 to 21 days. Live West Coast littleneck clams: 4 days. Live Butter Clam: 3 days. Littleneck and Butter Clams are typically sold in their frozen form. fresh then it is good to eat.